We brush our teeth to remove food debris and plaque, a sticky film of bacteria that constantly forms on and between our teeth. Whilst brushing twice a day removes much of the food debris and plaque on the surface of the teeth there is still about 35% of the tooth’s surface that isn’t being reached. If we don’t clean between our teeth the build up of plaque deposits in these areas can cause the gums to bleed and result in tooth decay and gum disease. You should therefore clean between your teeth once a day, preferably in the evening before brushing your teeth. These are small reusable brushes which come in different widths to suit the size of your gaps. For maximum benefit use the largest brush size that will fit in the space. You may find that you need to use more than one size. The brush should be inserted between teeth keeping it close to the gum and moved back and forth a few times. It sometimes helps to curve the brush to reach the back teeth. Interdental sticks are tapered plastic sticks with a soft rubber coating and again come in different sizes to suit different gap sizes. They also need to be inserted close to the gum and moved back and forth. Dental Floss / Tape is a soft thread usually made of nylon. Floss is usually rounded like a rope and tape is flat and wider and usually preferred by people with larger gaps between their teeth. 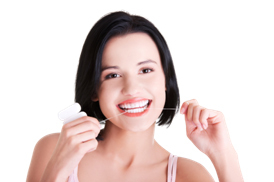 We recommend choosing a waxed variety of floss/tape as it slides between teeth more easily. To use, slide the floss between teeth and gently push it down below the gum as far as you can comfortably go. Push floss against the side of the tooth and move up and down. Repeat on both sides of each tooth. These are disposable hand held plastic holders that are pre-threaded with a piece of dental floss. Some people find them easier to use than a piece of dental floss due to the handle. The technique used to clean between teeth is exactly the same as for floss. 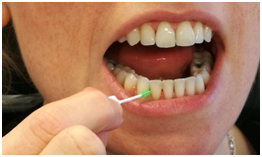 When it comes to choosing an interdental cleaning aid, there is no one size fits all. It will depend on the size of the gaps between your teeth, your dexterity and whether you have implants, crowns, bridges or braces for example. Our dentists and hygienists will be happy to advise you on the best products for your teeth and show you how to use them. We stock a wide variety of interdental products in the practices. Our reception team will be happy to help you. If you haven’t cleaned between your teeth before your gums might be a little tender and may bleed as you start to remove the plaque build up. Don’t worry – this is completely normal and you are not causing damage. It can look like a lot of blood, but as you persevere the bleeding will reduce as your gums become healthier. You will soon notice the difference. Remember for optimal oral health, cleaning between your teeth is as important as brushing!